I have rather mixed feelings about historical fiction. On the one hand, it was probably historical fiction that led me to my love of history in the first place, and the type of history that attracts me always has a strong human and imaginative thread to it. When there is a basic fidelity to the setting and the mentalities of the main characters, then I love it. It can be playful with the facts, but not earnestly wrong. I really relished Peter Mew’s Bright Planet set in- surprise, surprise- 1840s Port Phillip, and Patrick White’s historical fiction (e.g. Fringe of Leaves, Voss ) is solidly grounded in research and yet nuanced and sophisticated in its themes. But I have my reservations too. I agree with Inga Clendinnen (my heroine) with her qualms over Kate Grenville’s The Secret River and the issue of historical fiction attempting to contribute to a historical debate. I am annoyed when something is just plain wrong- the research has been done and exhibited, but it’s WRONG! I dislike the arrogance of projection of modern mentalities onto characters set in the past. I sometimes feel as if the story is suffocated by meticulous research that the author can’t bear to let go of. Which leads me to Rose Tremain’s Restoration. It is set, as you might guess, in Restoration England, complete with Charles II, the Great Fire and the Plague. There’s a certain predictability about this- of course they are all such write-able events that no author writing a book set at the time could resist them! I thought that Tremain captured the voice of a 17th century male writer well, and my admiration for it increased even more when I returned, as I do from time to time, to www.pepys.diary.com to read Samuel Pepys’ diary entry for the day. But of course, ventriloquism is not the same as creation, and it added to my sense that I was reading a set piece, with hackneyed settings and events and a reproduction of a 17th century voice. This probably sounds more scathing than I mean it to be: I enjoyed it well enough, happily persisted to the end, but I only rate it as a ‘good enough’ read. Today’s real estate agents really can’t hold a candle to those of the 1840s. Not only did they offer champagne lunches at THEIR auctions, but their literary and biblical effusions really do put modern billboards and advertisements to shame. In Saturday’s Age there was a full-page advertisement ‘Honoring the Life of a Great Australian: Ken Dyers 14 July 1922-25 July 2007’. No doubt the anniversary of his death (it’s odd that there’s no word for that) has prompted this outflowing of emotion. Apparently he was the founder of the Kenja Communication group (see http://en.wikipedia.org/wiki/Kenja_Communication) and he previously had links with Scientology. Kenja was named in NSW Parliament as a “sinister organisation”, and there have been suggestions of sexual abuse of children and a link between Kenja and Cornelia Rau’s mental state. According to Wikipedia, for $130 you can undergo an Energy Conversion Session, where you sit opposite another person and stare into their eyes. That would do it, I reckon. Anyway, what interested me most about this advertisement was the list of the names of the people who signed, and I assume, paid for this advertisement. During the Howard government, there seemed to be a string of letters by Eminent Australians castigating the government over treatment of refugees, climate change, industrial relations legislation etc. etc., and a cynic would sniff that they were all signed by the ‘usual suspects’. I was interested to see if the ‘usual suspects’ had signed this one too. Certainly not. There was not a single name that I recognized. There did seem to be a preponderance of sports people and dramatists. And how cute, people affixed their academic qualifications- two Ph.Ds, quite a few Bachelors degrees and even an Associate Diploma of Medical Reception Administration- there’s a qualification to conjure with!! Several company directors, a few personal trainers, and even a “Mother of Five”. But, thankfully, no-one I’ve ever heard of before. Perhaps it’s all this reading about mumbo-jumbo, but I have never been completely won over by Barack Obama. There’s something that disturbs me about the lack of content in his rhetoric- what is he actually talking ABOUT? “Hope” and “change” could be easily interchanged with “love” or “freedom” and his speeches would still soar and the crowds would still roar. 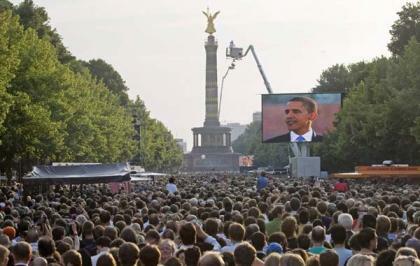 I was transfixed by this picture of his speech at the Victory Column in Berlin’s Tiergarten Park. There’s a screen, and another screen, and then right in the middle, under the column is a tiny little dot that is Obama himself. An edited version of the speech was reproduced in the Age. I’m quite interested in the rhetorical speech as a genre with its techniques and cadences, and this is a brilliant example. People of the world- look at Berlin! Look at Berlin, where Germans and Americans learned to work together and trust each other less than three years after facing each other on the field of battle. Look at Berlin, where bullet holes in the buildings and the sombre stones and pillars near the Brandenburg Gate insist that we never forget our common humanity. People of the world- look at Berlin, where a wall came down, a continent came together, and history proved that there is no challenge too great for a world that stands as one. “People of the World- look at Berlin”, repeated over and over, enough for us as listener/readers to realise that there’s a pattern at work here. From Kiev to Cape Town, prison camps were closed, and the doors of democracy were opened. Nice alliteration there- Kiev, Cape Town….but I’m not quite sure of the causal relationship though. And a bit more alliteration- “the doors of democracy”. Democracy has doors? The terrorists of September 11 2001 plotted in Hamburg and trained in Kandahar and Karachi before killing thousands from all over the globe on American soil. Hamburg…hmm how inconvenient. But at least we’ve got the K-places, Kandahar and Karachi where all this nasty stuff really comes from. It’s all really their fault. As we speak, cars in Boston and factories in Beijing are melting the icecaps…bringing drought to farms from Kansas to Kenya. Yep, that alliteration works a treat…. This is the moment when we must defeat terror and dry up the well of extremism that supports it. This threat is real and we cannot shrink from our responsibility to combat it. This is the moment when we must renew our resolve to rout the terrorists who threaten our security in Afghanistan and the traffickers who sell drugs on your streets. This is the moment when we must build on the wealth that open markets have created, and share its benefits more equitably. This is the moment we must help answer the call for a new dawn in the Middle East. This is the moment when we must come together to save the planet….. This is the moment he should stop saying “this is the moment”. People of Berlin- and people of the world- the scale of our challenge is great. Let us answer our destiny, and remake the world once again. And here we back at the beginning with the people of the world looking at Berlin again. A carefully crafted, absolutely honed rhetorical performance. Not that there’s anything wrong with that. But just remember, folks, it’s still a performance. It was the week-long World Youth Day in Sydney that prompted me to read this book, although I was, I confess, disconcerted by the big yellow chicken on the front and Jeremy Paxman’s acclamation of it as “hilarious”. I don’t really know that “hilarious” is the apt description- certainly the author swipes both left and right in his tirade against mumbo jumbo. He attacks post modernism (saving special venom for Julia Kristeva- I’m with you on this one, Francis! ), Thatcherism, New-Ageism, Blairism (particularly), globalism, fundamentalism- really, there isn’t an “ism” that he doesn’t turn on. At its core, the book is an argument for “truth” and the principles of the Enlightenment, but in all this slaughter of sacred cows, it’s difficult to detect what he is in favour of. He is rather cavalier with his quotations and footnoting- he is careful about one quote on a page, but completely silent about another more outrageous quote from another source on the same page- which makes me a bit distrustful of his academic thoroughness. And I find myself still wondering HOW mumbo-jumbo conquered the world. 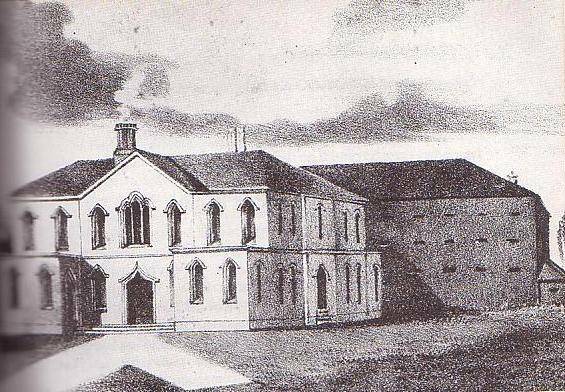 July 25 1842- a momentous day! Starting off from the old court house (seen above in my header), this was some procession! It was estimated that 4000 people were in attendance: quite a turn-up in a city of about 7000 people. The presence of the Masons is emphatic and striking. The involvement of the school children is heart-warming. But where was Superintendent LaTrobe?? The procession wended its way along Collins Street, up Elizabeth Street and turned right along Lonsdale Street to make its way to the site of what is now the closed City Court on the corner of Russell and LaTrobe streets. 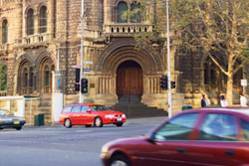 This location was in close proximity to the newly-completed Old Melbourne Gaol just behind it and was on the outskirts of the settlement. Peter Ackroyd, in his book London, described that city as a palimpsest where different iterations of buildings, often serving the same purpose, were built on the one spot. This is true here: the ‘new’ Supreme Court building built in 1842/3 was demolished by the end of the century, to be replaced by the City Court (which to my eye looks much older than that). It is no longer used as a court, and has been taken over by R.M.I.T. The ‘new’ Supreme Court building was the most expensive erected in Port Phillip to that date, with an initial quote of 7480 pounds (Deas Thomson to LaTrobe 23 July 1842). There was professional jealousy and argy-bargy between Lewis, the Colonial Architect up in Sydney, and Rattenbury the Clerk of Works here in Melbourne over the size, design and cost of the building. In particular, Lewis was critical of the lancet windows that Judge Willis was particularly enamoured of. He added that in all probability before its walls were grey with age he would long have left them; but that wherever and in whatever position he might be placed, his warmest wishes and best exertions would ever attend the colony, which if left to its own resources and own self-government, unshackled by other districts, would rapidly rise in general prosperity and be the first province of the crown in this hemisphere. Port Phillip Herald July 26 1842. A bit of playing to the gallery there: Port Phillipians were clamouring for self-government, and the Sydney/Melbourne rivalry that still exists today was there in 1842 as well. Warmest wishes for the colony? Bah! He fulminated about Port Phillip and Gov. Gipps the whole way home. And as for the walls being grey with age? Not likely. They hadn’t even finished painting the building when he headed off for home, after being dismissed. It opened for business as his ship sailed for South America. He’d laid the stone; he’d gone for a stroll each time to inspect the progress; he’d pushed for those lancet windows…but he never got to sit in ‘his’ court. It opened the week after he left, with his successor, Justice Jeffcott presiding. This won the Booker Prize, and it’s very much like his other books. There’s his care, deftness and sophistication of language and vocabulary; a deluded and unreliable narrator; and allusions to an artistic and professional life in which the main character immerses and obscures himself. Banville’s handling of three timelines is masterful. A widowed art historian returns to a childhood holiday spot, where he reflects on his wife’s recent death from cancer and recalls his infatuation with the mother of a childhood friend in a golden summer of his early adolescence. In this regard, the book reminded me of Ian McEwan’s Atonement and L.P. Hartley’s The Go-Between. Banville slips effortlessly between these three storylines and there’s a dishonesty about his narrator’s telling in of all of them, through a mixture of naiveté, pomposity and emotional blindness. Banville writes so well- his descriptions are often so beautiful and apt that you stop to savour them. The ending was, perhaps, a bit of an anticlimax but it’s the language and sheer virtuosity of the author’s writing that is the real strength of this book.